All I want to do is be a ‘spark’ to enlighten your view of any narrative work … and allow you to appreciate it even more. What I’m not going to do is ‘talk down’ to anyone. This is a serious field, full of serious issues, making programs in a serious fashion …but I’m also going to make sure you don’t need an MA in Literature to understand what’s being talked-about. Cinema and Television have always been media for the masses. Not just the undereducated masses …but everymass. In contrast to Cinema, Television developed a whole new communication dynamic for narratives on at least three fronts. Firstly, it brought the characters and action directly into one’s home. It changed the paradigm from a dynamic where one had to go and find the content …to one where the content finds you in your home. We welcomed Lucy and Desi into our homes to entertain us. We didn’t even mind Ralph regularly threatening to hit Alice right in the ‘kisser’ … in OUR lounge rooms no less. Secondly, it allowed for many different forms of narrative, whether they be 30 or 60 minutes on a weekly basis for 22 weeks in the year, or 60 minutes on a nightly basis for a week (mini series). The ability to continue developing characters over 220 hours of narrative is something only Capra could have dreamed-of … and even Doestoyefsky couldn’t approach. Thirdly, television narratives had the opportunity to also be a mass communal affair. Sure, we watched at home on our own, but 10s of millions could be watching at home, alone, together. Who shot JR? 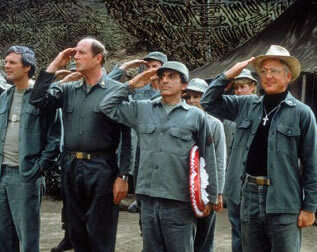 The last episode of M.A.S.H. Two wonderful examples of massive shared experiences. Don’t get me wrong, most television is absolute crap. But there is so much so much of it, that if only one percent of television narratives were viewable …that would still ensure there are 1000s of hours of gems out there.